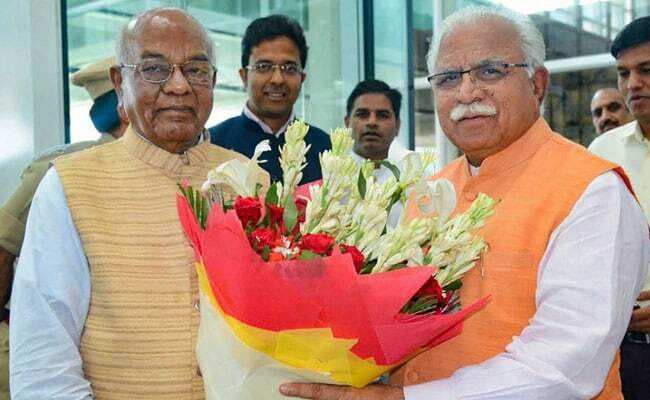 Satyadev Narayan Arya, a senior BJP leader and an eight-term MLA in Bihar, replaced Kaptan Singh Solanki as the Governor of Haryana. Satyadev Narayan Arya, a senior BJP leader and an eight-term MLA in Bihar, replaced Kaptan Singh Solanki who became the new Governor of Tripura. He was also a minister in the 2010 BJP-JDU government in Bihar. He was born at Gandhi Tola in Rajgir, in Bihar's Nalanda district on July 1, 1939. He is an M.A and law graduate from Patna University. The newly appointed governor personally met the people who had come to attend the oath taking ceremony last Saturday, and accepted their congratulations and greetings. Mr Arya expressed his gratitude towards the people who had graced the occasion and had come from far flung areas of Bihar to attend the oath taking ceremony of their beloved leader. The function, which happened on August 25, was attended by Haryana Chief Minister Manohar Lal Khattar, Judges of Punjab and Haryana High Court, senior officers of Haryana, Punjab and Union Territory of Chandigarh and prominent citizens of the city. On reaching Chandigarh, Mr Arya along with his wife was given a warm reception by chief minister Khattar and his cabinet colleagues, senior officers and staff of the Haryana Raj Bhawan. The members of the governors' family, including his sons Omprakash Ranjan and Kaushal Kishore, daughters Sunanda and Kanchan Mala and other relatives, were also present at the ceremony. The prominent persons who attended Satyadev Narayan Arya's oath taking ceremony included the Speaker of the Haryana Vidha Sabha, Kanwar Pal Gujjar, Health Minister Anil Vij, Minister of State for Mines and Geology, Nayab Singh Saini, MP, Rattan Lal Kataria, among others. Satyadev Narayan Arya previously held the portfolios of Minister of Rural Development from 1979-80 and Minister of Mines and Geology, Bihar, in 2010. He has been elected Member of Bihar Vidhan Sabha eight times from Rajgir assembly constituency. He is known for his frank and straightforward approach toward political, administrative and constitutional matters, as per the release. Satyadev Narayan Arya has also been the president of the schedule caste cell of Bihar state BJP for two terms from 1988-1998. In 1962 he joined Rashtriya Swaymsevak Sangh and became its active activist. He had to face a number of hardships during the Emergency and during BJP's Ram Mandir movement in Ayodhya and was arrested several times, the release said.